Vector Magic features a very powerful and convenient drag-and-drop interface that lets you get images in and out of the program very quickly. 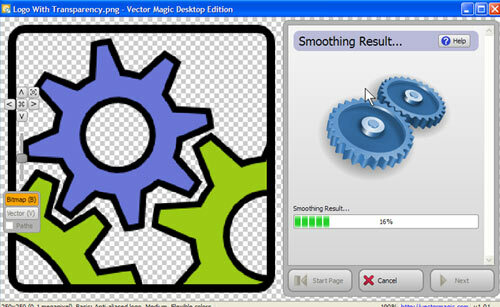 Vector Magic is demonstrated in the demo video. You can also copy bitmap content to the clipboard and Paste It straight into the desktop application. Since most Modern software supports both copy-paste and drag-and-drop, this provides seamless integration with most graphics software. Vector Magic can easily Convert Bitmap Images To Clean Vector Art. When you buy a license you get a product key that you can use to activate the software and enable saving of the results. Vector Magic full version is the same download as the free trial. When activating you turn the free trial into the full version. Any computer you wish to activate the software on has to be connected to the internet during the activation process. To upgrade from a previous version, just download the latest version and install it. The full version and the free trial are the same download. What are the benefits of Vector Magic Desktop Edition? Creates vector color images composed of outlines. Converts architect, mechanical and various technical drawings to vector formats. Qweas is providing links to Vector Magic 1.15 as a courtesy, and makes no representations regarding Vector Magic or any other applications or any information related thereto. Any questions, complaints or claims regarding this application Vector Magic 1.15 must be directed to the appropriate software vendor. You may click the publisher link of Vector Magic on the top of this page to get more details about the vendor.